$10,000 PRICE DROP ON THIS CRUISING BEAUTY !!! 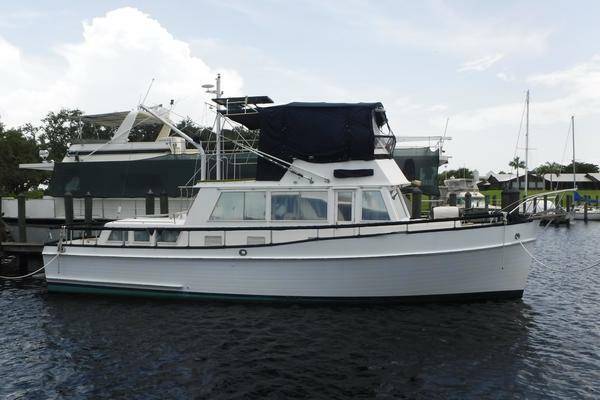 This 1982 40’ Ocean Alexander Ocean 40 Trawler has been completely refurbished from top to bottom over the last 2 years. Starting with a completely new bottom and bottom paint, new rudder posts, serviced props with Prop Speed, serviced thru hulls, Awlgrip cream hull paint, new SS rub rails, Awlgrip white on cabin house and flybridge and rebuilt mast. The teak decks were removed and the decks re-glassed and Awlgripped with non-slip. The 3 hatches in the cockpit were removed and the one large hatch was rebuilt to offer access to the rudder posts and offer a huge storage area. The teak swim platform was removed and a new fiberglass swim platform installed with SS supports. New electronics were installed on the flybridge and isinglass replaced where necessary. Then work started in the engine room. Both diesels were serviced by removing the oil coolers and the heat exchangers and having them cleaned and serviced, all raw water pumps were replaced with new, new impellers, new hoses, new belts, Etc. The floor between the diesels was rebuilt and new 8D batteries installed in battery boxes. The hydraulic system was serviced, the stuffing boxes rebuilt and the list goes on. Most of the interior was rebuilt including white Formica panels on the bulkheads to brighten up the boat, new cushions, new mattress’s, all wood varnished and all 3 front windows and frames replaced. The all around windows got snap on window covers and both air conditioners were replaced with new reverse cycle 16,000 BTU air conditioning units. New Isotherm hot water heater and new Isotherm drawer fridge/ freezer were installed. Rossana is a beautiful blue water cruiser with room to sleep 6 owners and guests and has all of the amenities for living aboard. This galley up type trawler is heavily in demand and will not last long in this cruisers market. If this world cruising trawler is of interest, please call us to preview this rebuilt beauty and start your cruising dreams today. Entering the vessel from the starboard side door you will find the lower helm station forward and the stairway down to the guest stateroom centerline. The guest stateroom has a large closet to starboard with one berth lower and the anchor locker access forward and the upper berth on the port side with large storage lockers under the berths. Moving aft to port is the guest head with privacy door, sink, Vac-u-flush toilet, cabinet stoarge and shower with sump box. Back up to the salon you will find the chart drawer and chart display area and the L shaped settee to port with storage under and all around large windows with pull down black out shades and exterior sun covers. Moving aft is the port side sliding door to the port side deck followed by a storage locker, shelves and TV. Across to starboard is the L shaped galley area with counter tops, double SS sinks, stand up Norcold fridge freezer (needs replacement or could be turned into a pantry), Isotherm drawer fridge freezer, microwave oven, broiler/toaster oven and 2 burner electric stove top (n/o). The salon floor is a varnished teak Parkay and aft of the salon is the stairway down to the master stateroom. Entering the master you will find a large closet to port followed by multiple storage drawers and storage lockers and a cabinet aft next to the centerline Island Queen berth with new foam mattress. To starboard find the stairway exit to the cockpit and more storage lockers and cabinets. Moving forward find a full length mirror and the entrance to the master head with small tub and stall shower, sink, Vac-u-flush toilet, cabinets and shelves. Exit the aft stateroom to the cockpit with large lazerette and gate to the swim platform. Moving forward to starboard up the side deck there is a step up to the aft deck with straight settee aft with storage under and forward to the stairway to the fully enclosed flybridge with upper helm station, storage lockers, L shaped settee with storage under and custom hidden fishing rod holder and outboard storage. Rossana sleeps 6 owners and guests in two staterooms and the convertible settee and has two full heads with showers. Rossana is a beautiful blue water cruiser with room to sleep 6 owners and guests and has all of the amenities for living aboard. This galley up type trawler is heavily in demand and will not last long in this cruisers market.